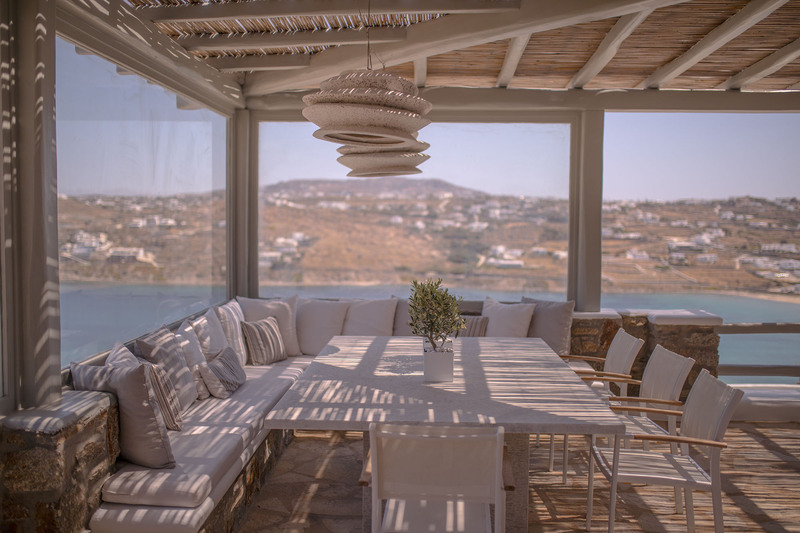 If you want to experience both the tranquil and vibrant sides of Mykonos, you just found your home away from home on the island. 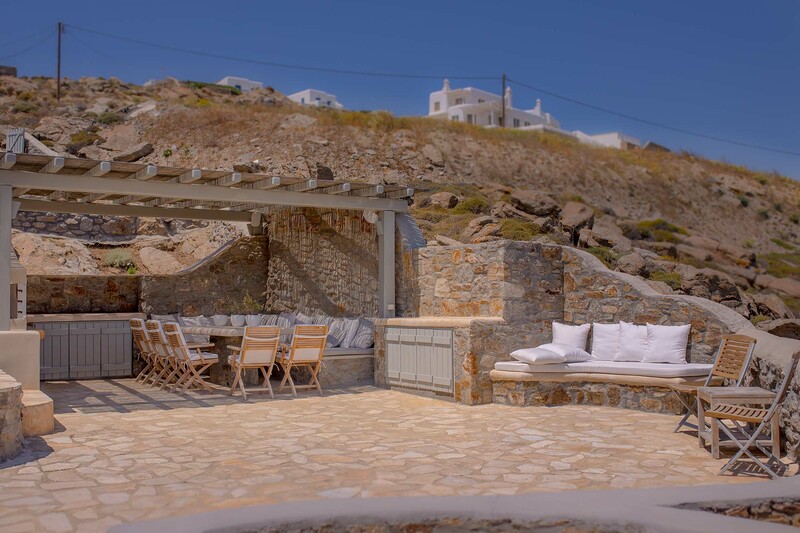 The villa, located in a quiet residential neighborhood just outside the village of Ornos, is the perfect residence for a group of 9 to enjoy a relaxing island vacation. 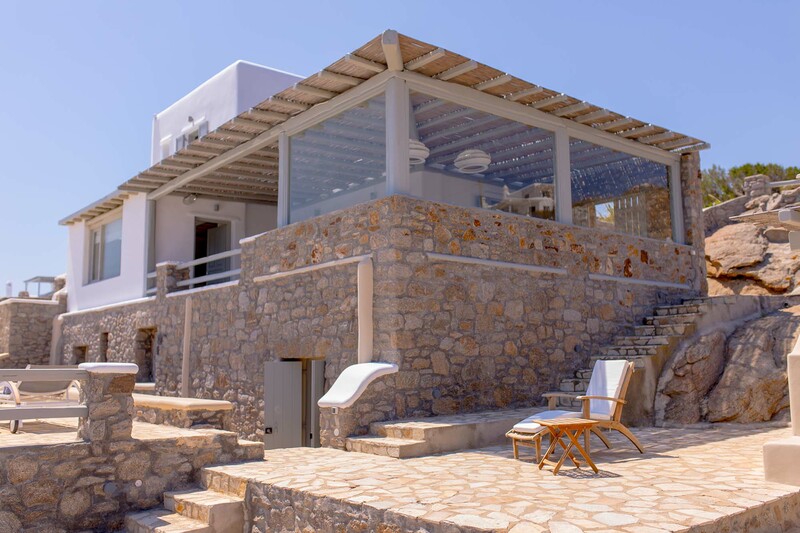 But with Mykonos town, shops and restaurants, and an array of beaches only a short drive away, you can’t miss the chance to take advantage of all the island has to offer. 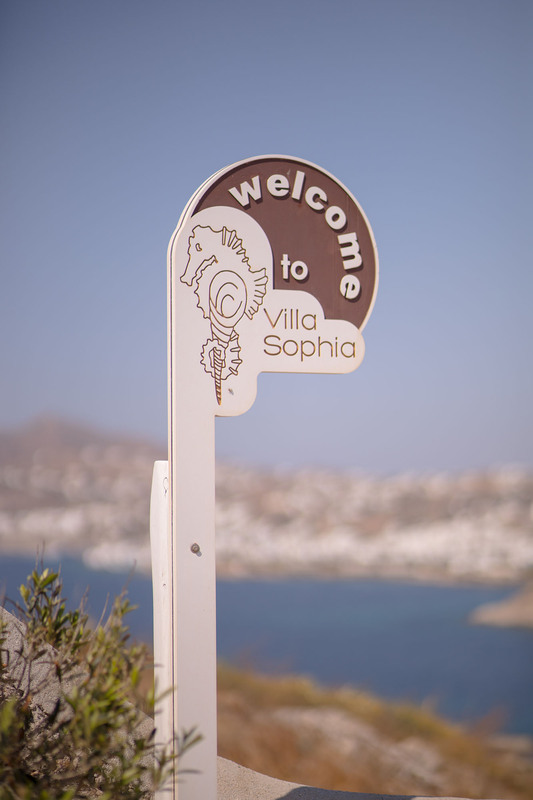 From the moment you arrive at the luxury Mykonos villa you’ll be won over by its sophisticated simplicity. Its gorgeous interiors take the finest elements of Mykonean architecture and add contemporary style to create an aesthetically pleasing ambience for you to chill in. 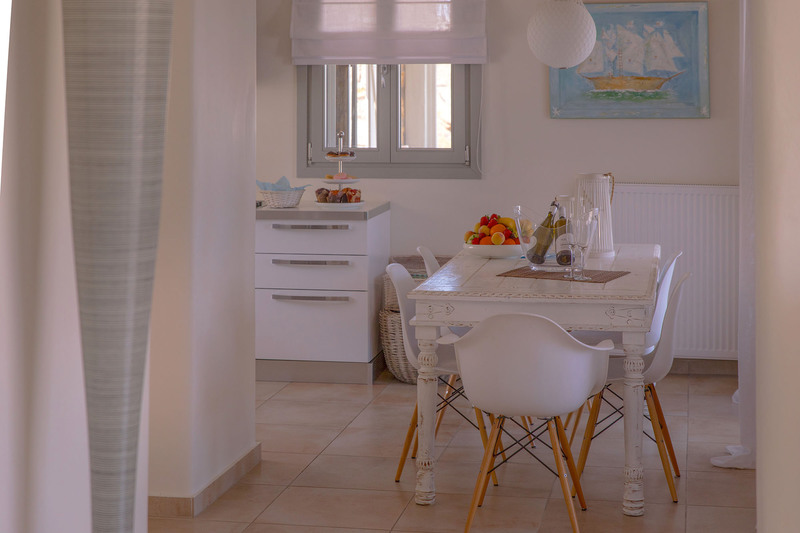 The guests can mix ‘n’ match in the bright and airy living room, which is connected with the dining area and the fully equipped kitchen. Open plan living at its simple best! 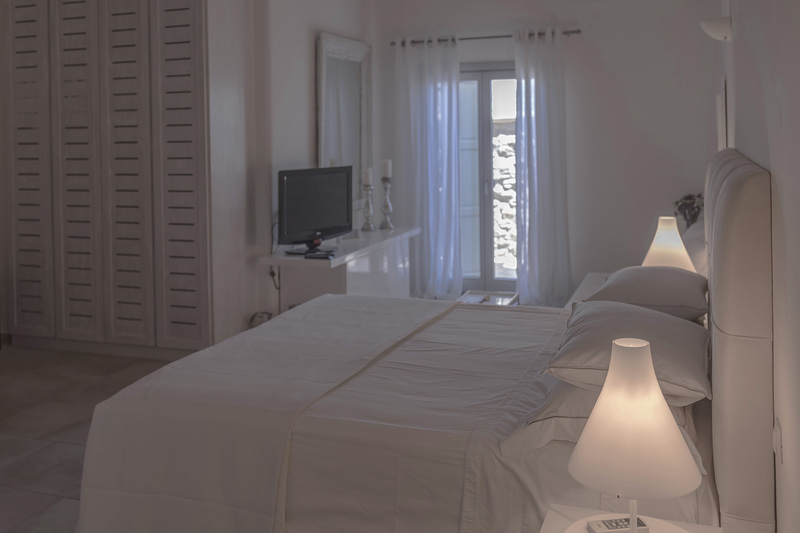 The 5 luxurious en-suite bedrooms are spread over the 3 levels of the house to guarantee the 9 guests will enjoy full privacy in their personal time. 1 double bedroom with en-suite bathroom with shower, hairdryer, A/C, flat screen TV, safe box, sea view. 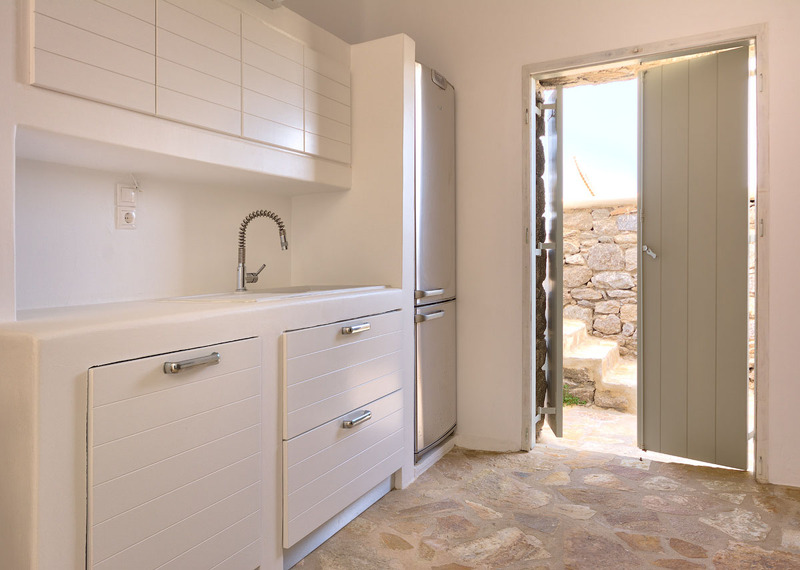 1 bedroom with single bed (1.00 x 2.00m), built-in side desk, safe box and en-suite bathroom. Double patio doors lead out to a small private yard with another door leading to the exterior seating and pool areas. 1 Master suite with a king size bed, en-suite bathroom with shower, hairdryer, A/C, flat screen TV, small sofa, safe box, side table and coffee table, patio doors leading out to the pool, 2nd patio doors leading out to an internal tunnel which accommodates a kitchenette and lounge area. 2 large bedrooms, each with double bed (1.60m x 2.00m), en-suite bathroom with shower, hairdryer, A/C, flat screen TV, safe box, patio doors leading out to the internal tunnel, kitchenette. Caressed by the soft sea breezes, the magnificent outdoor spaces make the most of its privileged location. 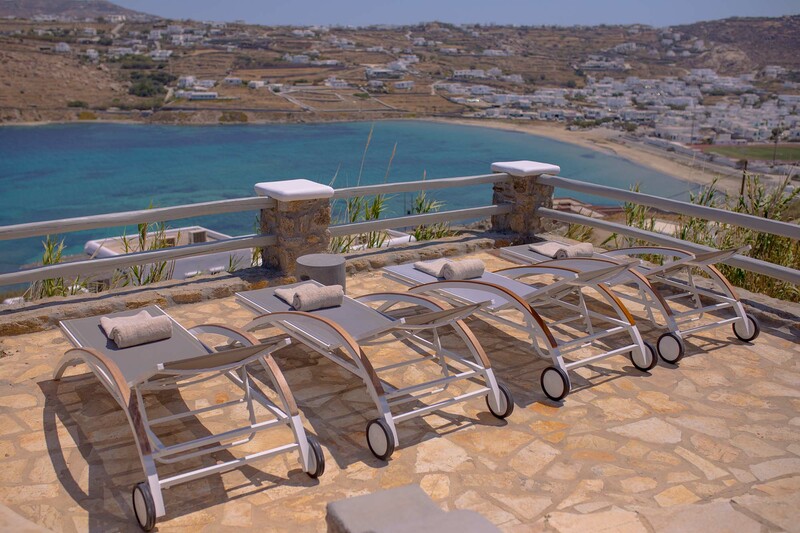 Descend the steps from the upper level to find yourself on the pool terrace, that offers bird’s eye view to the picturesque Ornos Bay. Keep your phone close at hand, because you won’t resist a selfie with such a view! The multi-level terrace has a corner for every time and mood of the day. 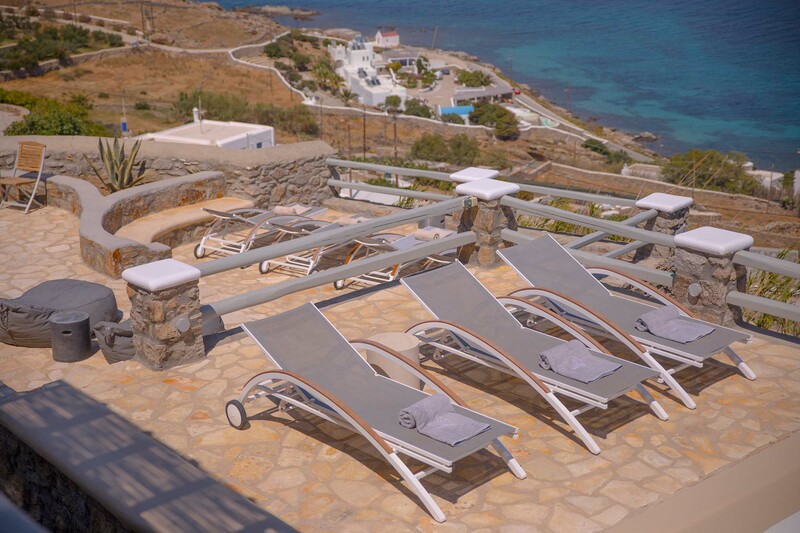 Enjoy sunny days on elegant loungers around the pool, relish a BBQ lunch at the pergola-shaded alfresco table or just relax and let the island take all your problems away. Ask our award-winning concierge, who is standby 24/7, for whatever you may need! In case you want an extra flavor of unique holidays, our experienced concierge is there to make your stay unforgettable! Tailor-made planning is our second name! Do you need a nanny or a hard-to-get table at a fancy restaurant? We will be happy to help you with advice or any service you request. 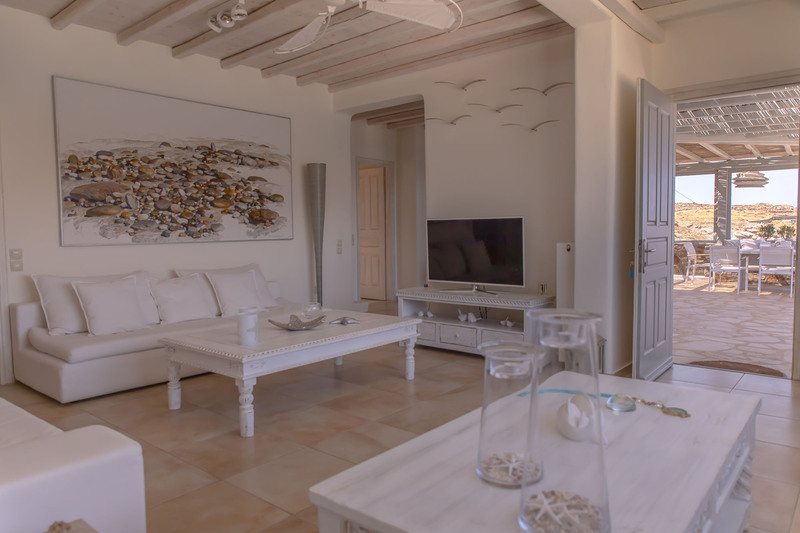 The villa is only a 4-minute drive to Ornos, a beautiful beach with green-blue waters and white sand, perfect for families. Its wind-protected location and shallow waters make it ideal for your kids’ first beach experiences! 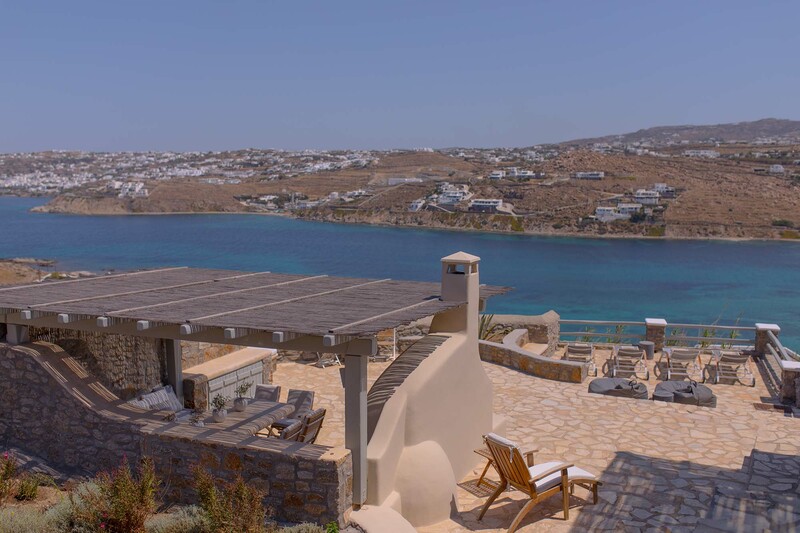 Mykonos town is also a 10-minute drive away, so you can be sure that you’ll miss nothing from the island’s vivid lifestyle!